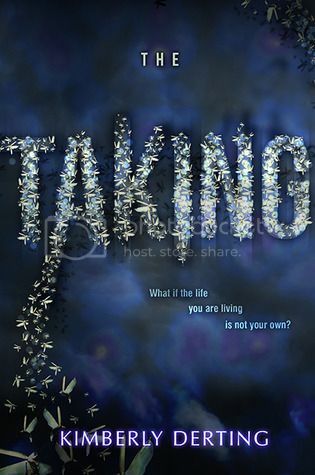 I’ve had a copy of The Taking to read for a while now, and I finally decided to start it today. What a great decision that was! I have read Derting’s Body Finder series, and The Pledge trilogy in the past, and really enjoyed them both. I couldn’t wait to get started on this book to see what new story Derting has in store for us. Let me just say this, you definitely will not be disappointed with this book! Sixteen year old Kyra Agnew has a great life. She has two loving parents, an awesome best friend, and a boyfriend that adores her. And all that changes in a flash of white light. When Kyra wakes up one morning behind a dumpster, with no recollection of how she got there, she heads home only to find out that five years have passed. While she hasn’t changed at all, everything else in her life has. Her parents are now divorced, and her best friend and boyfriend have moved on with her lives. Nothing is the same anymore, except for Kyra. With the help of her ex-boyfriends brother, Tyler, Kyra sets out to discover what happened when she disappeared. Poor Kyra, I can’t even imagine being in her situation. One minute she has it all, the next minute years have passed and she’s lost in a mess of confusion. But Kyra is a very headstrong young lady, and she was determined to figure out what had happened to her. And that’s exactly what she sets out to do with Tyler’s help. Tyler was such a great character. He has definitely made the list of my most swoon-worthy characters. I love that even when he had no idea what to believe, he still believed in Kyra, and that he would do anything that he could to protect her. Not only did Tyler and Kyra make a great team, but they make a great couple as well. Seriously, I could cut through the romantic tension with a knife! Tyler was such a sweetie. I am seriously kicking myself for not reading this book sooner. Once I started reading it, I couldn’t stop. I ended up reading the book in one day, which was a bit surprising for me. Once I started reading, I was hooked. There is a LOT of action and suspense in the second half of the book, it was intense! I seriously couldn’t put it down, and was sitting on the edge of my seat, holding my breath, waiting to see what was going to happen. The end of the book left me hanging a bit, so I’m dying to get my hands on the next book to see what is going to happen next! Overall, if you are a fan of Derting’s already, you will definitely love the beginning of this awesome new series. If you’ve not yet read her work before, The Taking is a great place to start! Add it to your reading list today! Sounds really good! I'm going to have to check it out. Although, I really hate cliffhangers and may wait until the whole series is available. :) Great review! Poor Kyra!! Can you even imagine five years passing and you not even knowing it? Now I must read this because I want to know what happened!! Alien abduction? Brain aneurysm? Kidnapping? OOoh great review! I am sooooo excited to read this one! I loved Kimberly's Body Finder series but wasn't real impressed with the Pledge. It was okay, just not my kind of read. This definitely sounds more to my tastes! Tried requesting it with Edelweiss but was rejected constantly. Oh well. We are officially in release month and I have Amazon Prime now, so only got to get through this month! Then I have to read it right away because the next week Kimberly will be in my city! Finally an author first! The first one since 2012! So yeah, sorry for all my rambling, great review! I can't wait to read it! I'll definitely put this one on my to-read list. Sounds amazing. I love starting new series and I haven't heard about this author before.